The groundwork of all happiness is HEALTH! Sign up for a FREE Sports Nutrition Report. We all do it every now and then – run to the vending machine after a disagreement with a boss or co-worker, stuff ourselves with ice cream when we’re depressed, have an extra helping of cake to celebrate a job promotion, or sneak a bite in the middle of the night when something’s bothering us. Yes, food is celebratory and comforting, and it’s perfectly okay to indulge every once in a while. But if you frequently use food to manage your emotions, you won’t be as successful in losing weight and keeping it off. Food is only a short-term fix and can actually intensify the emotion. For example, if you had a bad day at work and responded by eating a bag of chips, you might feel depressed and guilty once you realized that you ate the whole bag. On top of that, you might be fearful of adding more inches to your waistline. If emotional eating is a challenge for you, the first step is to identify what emotion your feeling. Once you’ve identified the emotion, ask yourself if food will really help, what you really need, and what you could do differently at the moment. Relax and take a couple of deep breaths. Allow yourself to feel the emotion. Write down your thoughts in your journal. Be sure to identify the specific emotion you’re feeling, what you need, and what you can do differently if your need involves food. 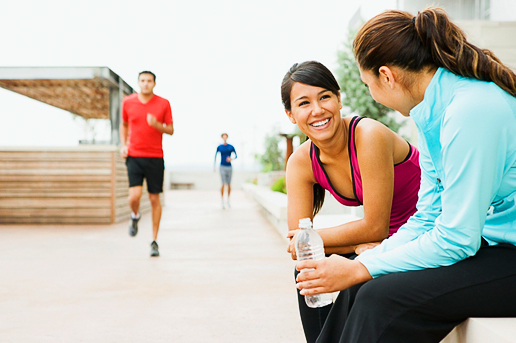 Take a power walk or engage in your favorite physical activity. This will help clear your head and get things into perspective. Studies also show that physical activity helps decrease feelings of anxiety, depression, and irritability. Call a friend. Sometimes all you need is a good venting session. Grab you iPod, your smart phone, or other device and listen to your favorite songs. Sometimes emotional eating is a deep-rooted problem and may require the help from a professional. If needed, seek counseling. Identify your triggers. Keep track of the times you overeat. Look for patterns of when, where, and what promoted you to eat. Evaluate the damage. Estimate how many calories you consumed. By keeping count of your calorie intake, you might be more careful the next time you feel tempted to eat out of habit. Determine the reason for the trigger. Then find a better way to reason with yourself the next time that trigger presents itself. For example, if you skip the popcorn, you’ll be saving yourself some money. Focus on dealing with one trigger at a time and start with the easier one first. Do you have any helpful tips that I didn’t mention above? Write them in the comments! I would love to hear your ideas! Remember, always think before you eat!